Trends: Trends, as the name suggests, are simply a way of seeing where the market is going by looking at the slope of the market line. Anyone who did this with Bitcoin at around the beginning of 2016 – when it began a gradual upward ascent – stood to make a fortune. Trends can be short-term, long-term, uward sloping, downward sloping or even horizontally. What’s important is to see the trend and trade on it profitably. Support and Resistance: Support and resistance is a common theory among technical analysts, which refer to those levels where it seems the Bitcoin trend line won’t pass (a level of resistance). Think of an asset which is just about to reach a landmark price (for example, with Bitcoin it could be $20,000; with oil, it was $100). It’s such a landmark that traders are almost afraid to go above it, so you get this bobbing slightly below the mark, called support and resistance. Candlestick Patterns: Candlestick patterns are a tool used by technical analysts that condense lots of data from longer time periods into visually easy-to-read charts, which show where a market is heading. They reveal several patterns, which can be interpreted in different ways themselves. There are literally hundreds of trading patterns which can all be recognized over time. Below, we look at five of the most widespread concepts and tools and show the most common examples of how technical analysis can be applied. The more of these you know, the more likely you’ll be able to conduct successful and profitable trades on both financial and cryptocurrency markets. And never forget to choose the right cryptocurrency broker who takes care of providing its client with proper education. Candlestick chart is the most widespread type of chart used in the technical analysis. This chart displays the HIGH, the LOW, the CLOSE and the OPENING for the price of specific asset for a given time frame. The wide part of the candlestick is called the real body and tell us whether the closing part of the candle was higher or lower than the opening price. If the candle closes below the opening price, we see the red body ( as seen on the chart terminal). Such candle is also called a NEGATIVE or a BEARISH candle. If the candle closes above the opening price, we see a blue body. Such candle is also referred to a POSITIVE or BULLISH candle. 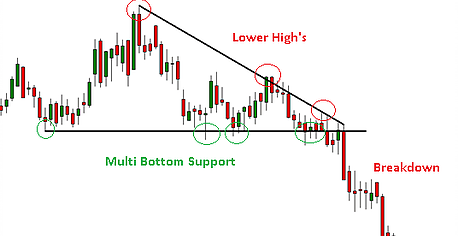 Understanding support and resistance is the first step that every trader should take in studying technical analysis. No tool is used more frequently than support and resistance that is why it may be of great benefit for Bitcoin and other cryptocurrency traders if used appropriately. Support and resistance represent price levels through which the price rarely goes above or below. Support is the price point through which the asset rarely falls. Resistance, on the other hand, is the level above which the market rarely goes up. We clearly see that the price was not trading higher than than 1.6800 while 1.6780 was a hurdle for the price to go further down, resulting in a prolonged price consolidation between mentioned levels. As such, it is safe to assume that Support and Resistance represent important price levels where potential reversal might actually happen. However, applying additional tools like Moving Averages or trend indicators is recommended when using support and resistance as basis of your trading strategy. A simple example would be using overbought\oversold indicators like RSI or Stochastic Oscillator together with support and resistance to make signals more accurate. A trend is the tendency of the market to move in a particular direction over time. It is an amalgamation of predictable price movements which the market takes when reaching support and resistance levels varying over time. Trends can be found on various time frames, and those found on the higher time frames can last for weeks, months and years. In simple words, market trend is the general direction in which the market goes or a period when the pattern of its movements remains unchanged. Bullish trend ( or an uptrend) is a term used to describe the market which is appreciating in value with each consecutive time period. In most of the cases, a trend is called bullish when the market is closing the day above the opening price. A bullish trend is associated with significant confidence and increased investing in anticipation that prices would rise in the future. One of the notable examples of bull markets include recent rally in US Stock market rally facilitated by the increased money supply and India’s Bombei Stock Exchange rally which saw its index rising from 2.900 to 21.000 points in a matter of five years. Bearish trend( or a downtrend) is an opposite to the bullish trend and is characterized by a general decline in the price of financial instruments over the period of time. It is usually triggered by a sudden shift from investor optimism to the fear and pessimism. Bear markets are associated with periods of elevated economic uncertainty and underlying downside risks. The most recent examples occurred as a result of financial crisis. The Stock Market Crash of 1929 and the subsequent Great Depression were followed by prolonged periods of bear markets as well. A range is a non directional market usually characterized by the price fluctuating from top to bottom and vice versa. 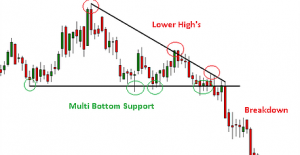 By finding major support and resistance levels,the trader may identify the boundaries of the range, which may be further considered as good price points where a position can be opened. Moving averages provide a good analysis of historical trends. They are calculated over specific time periods, taking an average price across these with most of the historical data excluded as the time period extends. A 20 day moving average applied on the price of the specific asset would not include the 21-st day into calculation. It gives the trader a good glimpse as to where the average price is located, and can be very helpful in trading if a shorter period average is applied over it. Shorter period averages , taking only a few days of historical data into calculation, always float in the vicinity of current price. Therefore, if 5 day moving average is substantially shifting from the 20 day one, we receive a clear indication that the market is trending in a specific direction. It should be noted however, that such occurrences should not be interpreted only as trading signals, as something what may initially look like a new trend may be far from being what it looks like. However, moving averages can help foreshadow reversals and as such assist trader in spotting profitable long-term entry points , especially when applied with other tools. Patterns play vital role in trader’s ability to identify long-term trends and trade successfully. With over 50 patters known to analysts very few have actually stood the test of time and proved useful in predicting potential outcomes. Triangle patters are especially useful when it comes to spotting potential breakout points and predicting continuation of existing or emergence of new trends. There are 3 types of triangle patters occasionally seen on the charts: ascending,descending and symmetrical triangles. Traders should carefully look for these patters and get ready to take action once triangles converge. Below you will see comprehensive breakdown of each triangle patterns and use pictures as a point of reference. Ascending triangle patters are bullish formations usually indicating a continuation of the upward trend. The patterns is characterized by 2 trend-lines. The first trend-line is almost flat and commonly moves along the top of the triangle. The upper line acts as a resistance point which prevents breakouts by sending security’s price back to the lower trend-line. With each subsequent failure to break upper, almost horizontal resistance point both lines eventually converge. 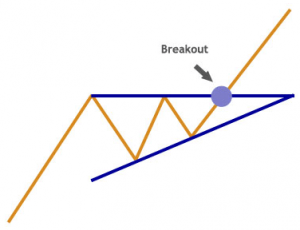 Convergence of both lines usually results in a breakout of upper resistance level. The basic interpretation is that the pattern reveals that each time sellers attempt to push price lower, they are increasingly less successful. This pattern is good for cryptocurrency trading as was frequently seen on Bitcoin and Ethereum charts. Another way of using the pattern is following the supporting lower trend-line. As you may see on the picture to the right, each subsequent failure to break below the lower liens results in a short wave higher until reaching resistance. Sellers get more and more exhausted with each failure to break below the lower line. As such, in combination with right indicators supporting line can be a profitable buy signal. As the name suggests, descending triangle is exactly the opposite to the patter we’ve explained above. Characterized by flat supporting line on the bottom and down-sloping vertical line , descending triangle is a strong bearish reversal pattern giving traders a strong signal that price will keep moving down once the triangle is complete. Usually formed during long up-trends this pattern usually indicates that buyers are getting weaker each time the prices bounces off the support. Each subsequent attempt at pushing prices higher is weaker than before, and eventually both lines converge and price usually break below the support line. A good strategy in this case would be opening a sell position following the breakout. In rare cases price fails to break below the support and moves up and breaks above the upper line. Such occurrences are mainly driven by fundamental events or by presence of longer term supporting lines visible on longer time frames. Make sure to analyze cryptocurrency price on several times frames before opening position. Looking at the picture to the right it’s hard not to notice how logical this pattern actually is. Several attempts at breaking support were rejected , price bounced off back to the resistance line. But, with each failure price formed lower HIGH’s along the borders of the upper line. Eventually,both lines converged and price broke support line. In this article we have explored the basic concepts of technical analysis and it’s application in cryptocurrency trading. While these concepts can be useful in most market conditions, remember that more education and diligence is necessary to become a good cryptocurrency trader. Market is known to be unpredictable on many occasions and that is why traders should look at it from different angles when trying to spot where next reversal or breakout may occur. Combining different indicators and finding which combination suits your trading style is a step each trader should take to build the right strategy. Remember that indicators have varying degree of accuracy depending on market conditions and in some cases the sound judgement would be taking a break while wild swings are underway. A smart, diligent trader understands that knowledge is power and money when it comes to trading and thus will never stop learning , even if the set of skills he has acquired over time looks enough to achieve whichever goals he or she sets ahead. Choose the right broker and start taking your steps right away.